Your password is foundational to your account security. So, increasingly, you'll be required to use a strong password for your accounts. This document will help you understand and create a strong password, as well as reset your Mercury Network password. Account adiministrators can also learn how to manage their Mercury Password security settings. Use the tabs below for more information. Start with "That's one small step for (a) man, one giant leap for mankind." That quote might be a little too long, so you could shorten it to "one small step for a man." Use this process with a personal phrase which no one could guess, and you'll have a very strong password that's easy to remember. Plus, you'll see that our example password contains 17 characters which, in Mercury, is considered an Optimal password because it contains more than 14 characters. Finally, when creating a password in Mercury Network, you won't be able to use any of your previous five passwords. This limitation is an industry-standard method for mitigating unauthorized use of passwords which may have become compromised. Basically, if someone gains access to one of your passwords, you'll eliminate their access to any account by making sure you don't ever use that password again. If you've received a notice that your password expired or that you need to update to a strong password, click the link on the notice to reset your password. Otherwise click here to go to the password reset page. You can also click Forgot your password? on the sign-in page. Enter your username (which is the e-mail address you used to create your account) then click Reset password. Shortly, you'll receive an email containing a Reset now button. Your password won't be changed until you click that button and finish this process. When you click the Reset now button in the email, you'll be taken to the Reset password page. Here, enter your new password, then again to confirm it. The Strength indicator will show you if your password is Optimal, Strong, Medium, or Weak. That's it! As a security measure, you'll receive an email to make you aware of the changes to your account, but you don't need to do anything about that message. You can use your new password the next time you log into Mercury Network. In Mercury, click Accounts near the top-right. Require password reset in: Check this item, then specify the number of days until all users will be required to reset their passwords. 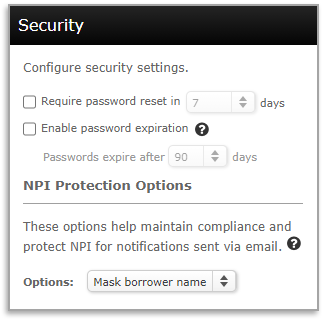 Enable password expiration: Check this item, then set the number of days between password expirations. The next password expiration will be that number of days from the date you enable this feature. For example, if the feature was activated on January 20th and you selected 90 days, your users will be prompted to reset their passwords on April 20th. Users will receive "password expiring" notifications beginning 7 days prior to the expiration date. Click Save in the upper-left to keep your changes. This document describes a strong password and how to create one, shows you how to reset/change your password, and explains how to control password security settings in Mercury.